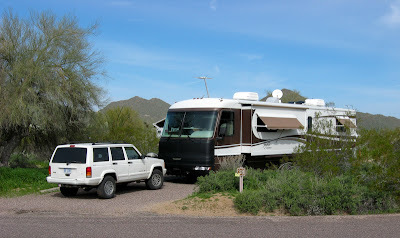 We are enjoying being here at Buckhorn Campground in the Usery Mountain Regional Park. This is another park with the 'it' factor for us. In fact, we would rank this in the top 10 best parks we have ever stayed. Each site is large with a lot of privacy, and has electric and water hookups. The park is located a few miles NE of Mesa and is on the edge of a mountain region. There are over 3,500 acres in the park that include the campground, a day use picnic area, and nearly 30 miles of trails for hiking, mountain biking, and horseback riding. It's also a bird watchers paradise. We set up our bird feeder pole when we arrived and we have had plenty of bird activity ever since. We love sitting outside watching them feed and listening to their constant chatter. Mollie loves it here too. She enjoys sniffing around the campsite as well as walking with us around the campground. 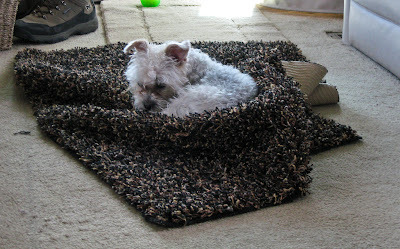 She also enjoys scrunching up the rug to make herself more comfortable. Last night we were treated to a concert of coyotes. There were 2 groups so I guess it was in stereo. This morning on our way to our hike we spotted one of the performers but he was shy and didn't want to pose for pictures or give us his autograph. 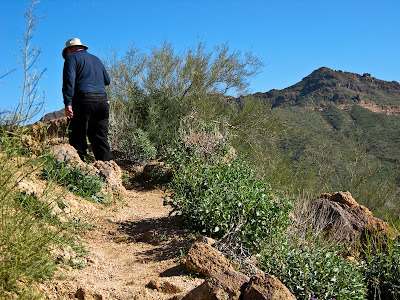 This morning we hiked the short( about 1 mile) Merkle/Vista trail which took us up and over a small mountain. 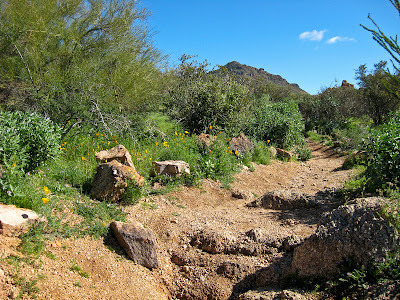 The desert is lush and green because of all the recent rain. In fact the desert flowers are just beginning to bloom and will be gorgeous before too long. 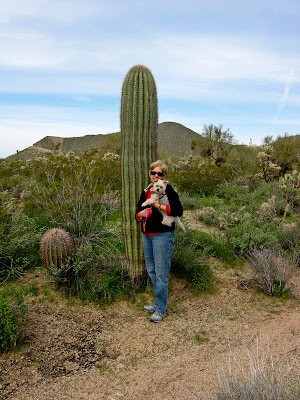 This is the desert, so of course there are cacti everywhere. Prickly pear, Cholla, Barrel, and Hedgehog cacti, are just a few that dot the landscape. 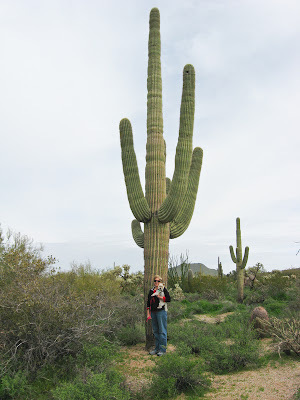 Most notable however is the Saguaro, which doesn't begin growing arms until it is between 60-75 years old, and can live for 200 years. 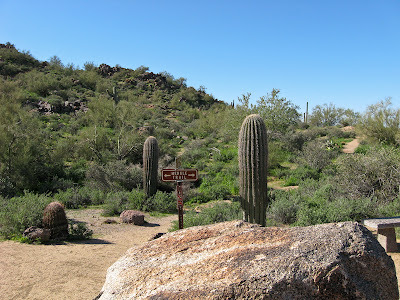 It's also protected by the U.S. Government and the blossom of the Saguaro is the state flower of Arizona. I think that if I was going to spend half my year living on an RV, this is the place I'd choose to be...what a great campsite, and those pictures of the desert are gorgeous. I've always thought the vibe in the desert is pretty cool, very peaceful.